Alas! A second life has been breathed into the floppy disk. 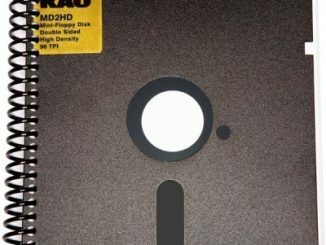 Etsy vendor Jim Buda has salvaged old floppies and computer parts to create the Floppy Disk Pen Holder. 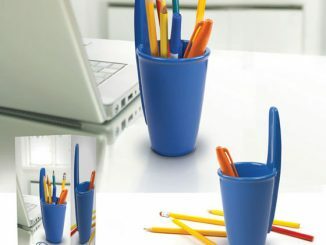 It’s the perfect size to hold a bunch of pens, scissors and office supplies, and you score extra bonus points because no excess plastic had to be manufactured in order to make this one-of-a-kind desk accessory. 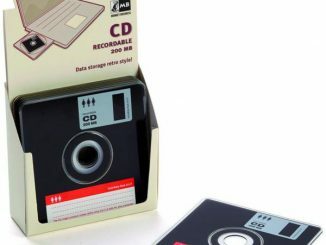 What to do with all those old 3.5″ floppy discs? 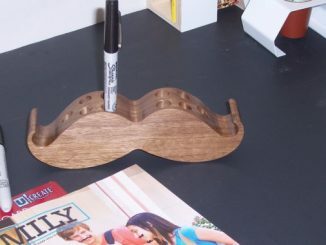 Wait … make some pen and pencil holders. We took old 3.5″ floppies, removed any labels and fashioned them into this unique pen and pencil holder. 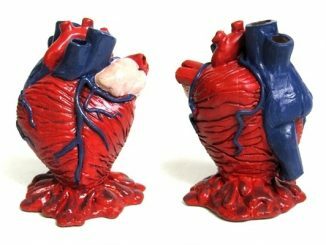 Great for your desk or the desk / work space of your favorite geek. A solid wooden base is attached to this triangle for a sturdy construction. Felt is then added to the bottom to eliminate any scratching of your furnishings. Refurbished key caps are then permanently glued around the bottom sides to complete this “geeky” look. In our original prototype we used tye-wraps for the corners. As we passed by our old computer stash, we noticed all the drive cables lying around. To keep with our recycling efforts, we took those cables, stripped them down and tied them off at the corners. A drop of glue assures they will not come un-done. While some days it seems like the world is going to hell in a hand basket, other days can be full of hope after witnessing random acts of kindness (and genius). 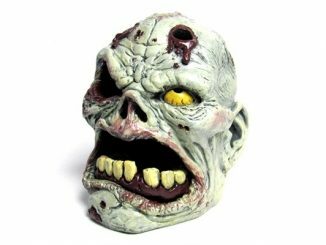 Simple solutions such as this pen holder are reminders that it’s really the geeks who rule, and not necessarily rockstar celebrities who think they rule, like Bono. 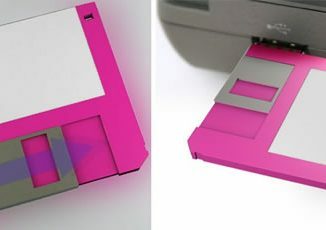 The Floppy Disk Pen Holder will look fab on any desk with its black sides and chunky keys for added bling. 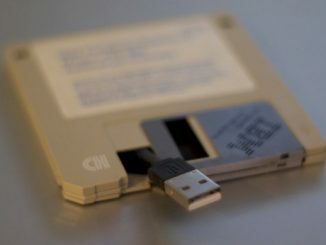 I’m sure this structure is going to last for decades since floppies are nearly impossible to destroy. 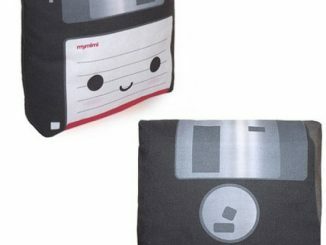 What else can be made out of floppies? 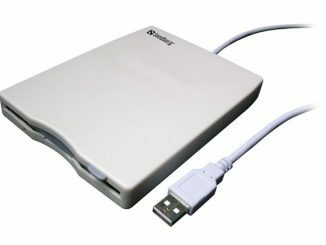 So far, we’ve seen the beige IBM USB Floppy Disk and the Computer Cat Wall Clock. 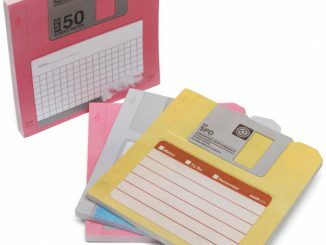 There’s even a Recycled Floppy Disk Notebook made from first-gen floppies. 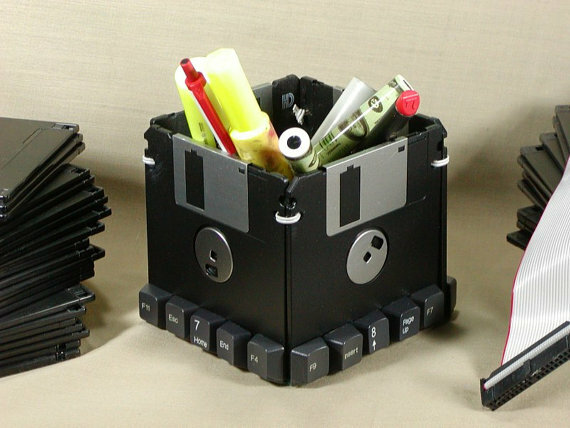 To buy the Floppy Disk Pen Holder for $9 US, go to Etsy.com. 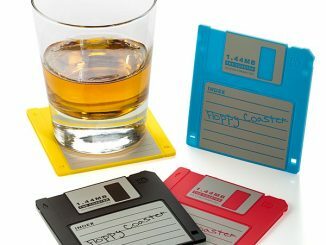 The old floppy disk might be dead when it comes to data storage, but it sure is alive and kicking when it comes to using it for creating new fun and geeky items.